I ❤💛 German Riesling (if you really love something, you break out the heart emojis). In fact, I’ve put German Riesling on a pedestal. For as many years as I can remember, German Riesling been my benchmark — the standard to which I compare all other Rieslings. A few months ago, the Mr. Armchair Sommelier and I were enjoying our anniversary dinner at The Inn at Little Washington, and we had a wine I can only describe as transformative (honestly, there’s very little about dining at The Inn that isn’t transformative). But this wine . . . I didn’t even look at The Inn’s multi-award-winning wine list. I mean sure, I opened it, but it’s 500 pages long (not literally 500 pages, but close). Could I pick a wine? Sure. But The Inn has a dedicated wine-staff way more more qualified than me for that task. Sommelier, take the wine-wheel! Our sommelier recommended a Riesling from 2006. An Alsatian Riesling. The little voice inside my head said , “Don’t you have anything from Germany?”, but I got her to stay quiet. We rolled with Alsace. And, without question, it was one of the best wines of my life. Behold, the 2006 Domaine Zind Humbrecht Herrenweg de Turckheim Riesling. Just get a load of that color — an aged Riesling is such a treat! Pre-Inn, I would have walked right by the Alsace section at the wine store. Post-Inn, I’ve been actively seeking out Alsatian Rieslings. And you know what? I’ve been wearing Riesling blinders — Alsatian Rieslings are dynamite! So where does that leave German Riesling? Fortunately, my Riesling pedestal is big enough for more than one region. I’m not knocking Germany off the pedestal (perish that thought), I’m just sliding it over a smidge to make room for Alsace. They can share the pedestal. If you follow my Carpe Vinum adventures, you know that a couple of us are heading to France on vacation this summer (I’m going Paris and north; my girlfriend is going Paris and south). 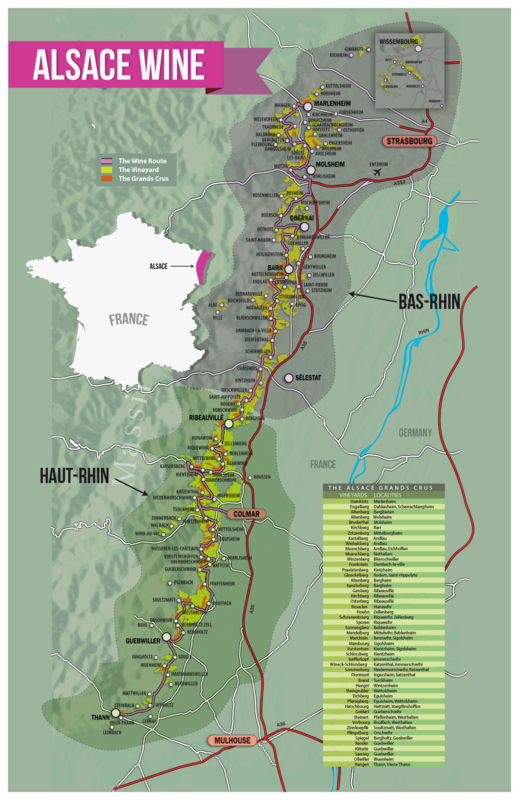 We’ve embarked on an in-depth study of the French wine regions where we’ll be traveling. Last month, we spent a virtual afternoon in Provence. And (as you’ve probably guessed), the next stop on our Carpe Vinum Tour de France is Alsace. What follows is my Alsace cheat-sheet for today’s tasting and pairings. If I didn’t know this is Alsace, I’d say it was Germany. Located in northwestern France, along the border with Germany, Alsace has been in a real estate tug-of-war for over 350 years. At the end of the Thirty Years’ War (1648), Alsace belonged to France. At the end of the Franco-Prussian War (1871), Alsace belonged to Germany. After World War I, Alsace was French once again. And it remained French until 1940, when the Germans rolled into France and re-annexed Alsace. After the Allies evicted the Germans in 1945, Alsace was French once again. Today, Alsace is decidedly French, but with a lingering German influence that reveals itself in the culture, architecture, language, food . . . and even the wines. Alsace is about 60 miles long (north to south), sandwiched between the Vosges Mountains to the west and the Rhine River to the east. The climate in Alsace is continental — the Vosges Mountains shield Alsace, making it a bit drier and warmer (allowing grapes to ripen more fully) than in Champagne and Chablis to the west. A whopping 90% of the wine produced in Alsace is white (that’s not the unusual part). The primary grape varieties are Riesling, Gewurztraminer (without the German umlaut), and Pinot Gris — three varieties which are essentially not grown anywhere else in France. Alsace wines often display the grape variety on the wine labels (can you imagine such a thing in Burgundy or Bordeaux?). The wines of Alsace are usually un-oaked. The soil in Alsace is like a patchwork quilt — the composition is often wildly different from one commune and/or vineyard to another. The potential for complex and varied expressions of terroir is off the charts. You could spend hours reading about the various soils of Alsace’s Grand Cru vineyards (you’d have to be really interested in soil, though). The bottom-line? The higher elevation vineyards have very thin topsoil on top of granite, schist and volcanic basalt. The lower elevation vineyards have deeper topsoil, on top of limestone (the fossilized seashells which contribute to Alsace’s famous minerality) and clay. The soil on the valley floor is alluvial, and a little “too good” for grape growing. Alsace AOC (1962): Produces roughly 74% of Alsace wines. AOC rules allow wines to be made from any of eight different grape varieties (as long as they are 100% varietal) — Riesling, Gewurztraminer, Pinot Gris, Auxerrois, Pinot Noir, Sylvaner, Muscat, and Chasselas. Blending is unusual, and only permitted in wines called Edelzwicker. Unlike other French regions, Alsace has no smaller sub-appellations. There are, however, a bunch of small communes (tiny geographic areas) that can be included on a wine label. Individual vineyard names (lieu-dit) are also permitted. Alsace Grand Cru (1975): These are the region’s highest-quality wines, and account for only about 4% of total production. There are 51 official Grand Cru vineyards in Alsace. Almost all of these wines are single-variety, and must be made from one the four noble grapes of Alsace — Riesling, Pinot Gris, Gewurztraminer or Muscat. Most Grand Cru vineyards are located in the higher elevations south of Alsace, or the Haut Rhin. Crémant d’Alsace (1976): These are the sparkling wines (both white and rosé) of Alsace, and they account for 22% of total production. Most of them are dry (brut) and the dominant grapes used are Pinot Blanc, Pinot Gris, Chardonnay, and Pinot Noir. Crémant is made using the same methods as in Champagne. Clos Vineyards: Though not technically an official AOC, wines with this designation are just as prestigious as Alsace Grand Cru, sometimes even more so. These vineyards are a holdover from the Middle Ages when walled monasteries (clos) were making wines. Most Clos vineyards are multi-generation, family-owned vineyards. Some vintners in Alsace prefer to display Clos on their label instead of Alsace Grand Cru (some of the clos vineyards have Grand Cru status, and some don’t). Clos Trivia: One of the most famous clos is Clos Ste. Hune, aka, the Romanée-Conti of Alsace. I took a quick look on wine-searcher.com — depending on the vintage, you can score a bottle for anywhere between $125-$650. (A blue-light special compared to Romanée-Conti). Sélection de Grains Nobles: Very sweet, very concentrated wines made grapes affected by noble rot, or botrytis. Vendanges Tardives: These are late-harvest, sweet wines. The grapes used for Vendanges Tardives are left on the vine to dry out, naturally concentrating their sugar content. They may or may not be affected by botrytis. Let’s talk about the weather: Alsace whites are known for their dryness, or their lack of residual sugar. However, the past few vintage years have seen much warmer summers in Alsace, producing riper grapes, and consequently, wines with higher sugar and alcohol content. Alsace Trivia: All of the wines in Alsace (with the exception of the Crémant) must be bottled in the flûtes d’Alsace, or flute shaped bottle, called Vin du Rhin. Here’s to the wines of Alsace (and making room on the pedestal) . . . Salud! Very true, Anatoli. The Grand Crus/Clos/Single Vineyard Alsace wines are where it’s at. And I’ve been seeking those out with fervor! Only problem is, (I’m sure you encounter this, too) most bulk wine stores only carry the entry level Alsace wines. So, special order it is! I’m curious — What’s your favorite region for Riesling?? New Zealand Riesling? Now there’s something I don’t have a lot of experience with! The Sauvignon Blancs, yes, but I don’t think about Riesling and New Zealand together. A Rieslings-Around-the-World theme would be fun for wine club . . . maybe difficult to equalize quality across the board, though. Any NZ producers in particular that you are fond of? NZ Rieslings are not widely available. I had a few at the tastings, but wouldn’t remember the names. The one I enjoyed and wrote about was Paritua from Central Otago… Wine-searcher shows some NZ Rieslings available – see what you can get. Ah, NOW you are speaking my language! While I do enjoy the German version, Alsace is my Riesling epicenter. I visited Zind-Humbrecht a few years ago and Olivier Humbrecht led us around—fantastic. I have a few of his wines in the cellar (Clos Häuserer) and a few other older Grand Crus that should be popped soon—we should try to get all of us together. You going to WBC? Would love to get all of us together! I’m undecided about WBC. My family will be in the Finger Lakes for our tri-annual wine trip in July, so I’m not sure if I will make a second trip up there in August. Plus, the weekend of WBC is the weekend before my kids go back to school. Horrible timing. But you never know when I might turn up . . . 😉! Great post, agree with the Drunken Cyclist. Don’t forget to checkout Australian Rieslings, especially aged ones from the Clare Valley. Thanks so much! I really do need to spend some more time with Australian wines, it’s probably the region that’s most underrepresented in my cellar (I think I might have two or three Aussie wines, and that’s it). It’s probably time to revisit this topic for my wine club! Thanks for the reminder. Cheers!! I am the opposite, need to spend more time on the wines from your part of the world. Some day I’ll make it there. My best friend has lived there for years. I cant wait to wine taste with here there. And Im totally with you in letting them choose. Cheers! You have a best friend in Alsace?? Score!! I’d start planning a visit today! Cheers! !